Earlier works by modern masters can do a number of things besides enthrall if they are well done. They can show you the roots out of which came the mature composer, the general milieu of his/her formative years, and perhaps can give insight into his stylistic development, the origins of the personal originality of the composer. All these things are discernable in a new disk of Bartok's early orchestral works, Kossuth, Two Portraits, Suite No. 1 (Naxos 8.573307) with JoAnn Falletta conducting the Buffalo Philharmonic Orchestra. Plus the music and performances are worthwhile in themselves. "Kossuth, Symphonic Poem, Sz.75A" was written when the composer was just 22. It is in honor of Lajos Kossuth, who unsuccessfully led Hungary in its bid for independence from Austria in 1848. At the time Bartok was under the spell of Richard Strauss, Wagner, Liszt and the general tenor of late romanticism, 1903 style. It is nonetheless a remarkable first venture into orchestral writing, descriptive, dramatic and in no way a clone of his influences. In 1907 Bartok was enamored with violinist Stefi Geyer, wrote his First Violin Concerto and presented it to her. She broke off relationships with him, kept the manuscript of the work nonetheless until that day she died. It remained unpublished until after her passing. Heartbroken, Bartok nonetheless proceeded to reproduce the first movement of the concerto as part of his "Two Portraits, Op. 5" in the following year, with the first movement renamed as "Ideal" and a short second portrait included, a kind of Bronx cheer dubbed by the composer as "Grotesque". Falletta and the Buffalo Orchestra give us a considered, impassioned version that features Michael Ludwig nicely in the solo violin role. "Suite No. 1, Op. 3" was composed in 1905 and has five movements. It is a colorful and lively work, filled with the musical aura of Bartok's homeland, and a touch of the later romantic bluster then au courant in the avant garde circles of those days. It has strength and breadth, however, that show Bartok a master tone-painter even in his early career. Lovers of the mature Bartok will appreciate these formative works for the kernels of greatness that they contain. They are works of stature surprising for a young composer of his time. And they stand on their own as worthy listens. Falletta and the Buffalo Philharmonic, as followers of her and the orchestra's recent recordings will not be surprised, excel in their vivid and measured, passionate readings of the three works. It is an excellent listen, an excellent addition to your Bartok collection. We still have catching up to do for the 20th century. Darius Milhaud (1892-1974) is a beautiful example. Between 1913 and 1923 he wrote the epic L'Orestie d'Eschyle, a massive three-part work for soloists, a large choir, orchestra and percussion ensemble, based on the Paul Claudel libretto of the Greek plays and their poetic re-presentation into modern French. 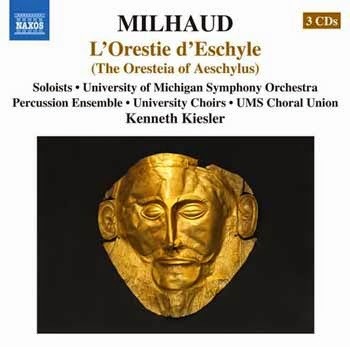 Kenneth Kiesler and the University of Michigan Symphony Orchestra, Percussion Ensemble, University Choirs and UMS Choral Union with soloists give us a complete modern recording on a new release (Naxos 8.660349-51 3-CDs). It is a revelation. It is a huge, sprawling work, filled with drama and impact, excellently performed by the amassed forces at hand. Indeed, it is an early-modern blockbuster. That it is not better known no doubt has something to do with its length and breadth. For all that it is a major find for anyone not familiar with it, an epic work of great power. Milhaud's polytonality and sense of aural drama gives the music an ultra-high-modernist charge that only Wozzeck rivals from the period. Even then, this achieves a hugeness even Wozzeck does not (though of course that opera was not about density as much as psychological expressiveness). There is no let up, even parts that might have been scored as recitative are chanted in a rhythmically primal ritual way. There's too much music to comment on in detail. And I am still digesting it. It's enough to assert that L'Orestie d'Eschyle is a forgotten modern masterpiece, fully deserving of recognition. This Michigan/Kenneth Kiesler performance gives us the work in all its glory and excitement. A tantalizing slab of post-minimal, radical tonality enters our ears (or mine, anyway) today. Michael Jon Fink returns (see posting from October 16, 2013) with a 18-minute EP of music for cello and piano, From A Folio (Cold Blue 0039). It is the opposite of formulaic. You can't be sure where the music is going but you know it will linger there a little while, then move on. 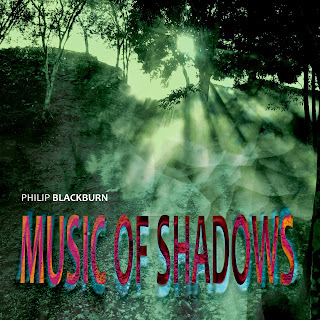 Seven very brief pieces form a kind of suite, each one exploring an overlapping set of patterns that go slowly and sensitively to some beautiful tonal realms but not simplistically so. There are slow ostinatos or melodic slowly quasi-arpeggiated phrases in the piano that evolve, cello suspensions and long tones, sometimes multiparts (overdubs) that create lovely chordal spellings and then move to others equally lovely but not following a road of cliche. There are slowly twisting melodies that see themselves mirrored in the dual instrumentation but never in the exact same musical image. 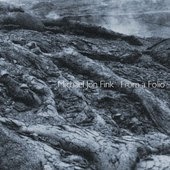 Fink's From A Folio gives us music of transparency, of slow shimmering sunsets, of repose, of deceptive simplicity that comes across initially as tranquil mood music but on repeated hearings has sophisticated grit and compositional substance. It is one of those Cold Blue albums that eventually haunts you, 18 minutes to contemplate the "being here" of carefully unwinding pastoral magic. I have come to love this music for a number of reasons. There is a deliberateness along with an expressive depictiveness. Nothing is what it seems at first, and yet it does not change from listen to listen. You do. Thank you Derek Stein, cello, and Maestro Fink, piano, for these beautiful performances. And Maestro Fink for the considered musical vision. The Finnish contingent of modern composers is well-represented and epitomized by Kalevi Aho (b. 1949), whose recent disk of concertos (Theremin Concerto, Horn Concerto) (BIS 2036 SACD) provides us with some stirring, memorable contemporary music. It is in the realm of expanded tonality, with an epic post-romantic quality, where the lush and the stark intermingle with a sense of longing perhaps, but also a sense of belonging to a long tradition of musical continuity within the modernist era. The Acht Jahreszeiten (Eight Seasons): Concerto for Theremin and Chamber Orchestra (2011) has an unforgettable quality. The Sami people of Lapland traditionally divided the year into eight seasons. The concerto follows those divisions--giving us a continuous musical analog of the evolving year, starting with "Harvest" and ending with "Midnight Sun". In the process the theremin part soars with lyrical beauty and presence, incredibly well played by virtuoso Carolina Eyck. She is a marvel. Not only does she tackle the advanced-harmonic-based part with ease and a beautiful sense of pitch, dynamics and subtle use of vibrato, but also she sings effectively in concordance with the theremin or on her own. It most certainly is a tour de force, one of the finest performances on the theremin I have heard. But it also holds its own as very vibrantly alive music, tone painting of a high order. Finally a concerto for theremin fully worthy as music. If there are others as fine I have not heard them. The Concerto for Horn and Orchestra (2011) has equal weight. It is in its own way as vivid a work, but more densely extroverted perhaps, on the whole. Aho takes advantage of the natural tendency of the upper partials on the horn to be out-of-tune and includes a deliberate use of that quality to create a very effective solo part that contains quarter-tones. Annu Salminen appears here in spectacular fashion, with the tonal colors the horn produces out front strongly but gracefully. It is another work worthy of inclusion on the disk. 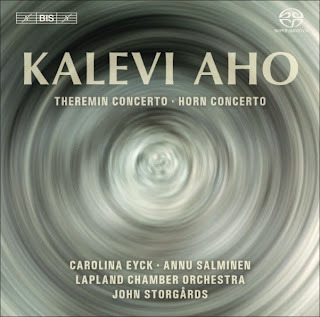 Kalevi Aho comes through with two inimitable concertos, then, that make an excellent case for his poetic compositional abilities. They are marvelous, well performed, exciting. Strongly recommended. No matter what our next winters may bring, or even considering all the winters we may experience in our lifetime, Aho gives us music that fits all seasons and transcends the present with a lucid timelessness. The winters of our discontent find solace here. Japanese composers of the modern classical persuasion have formed an important part of world output from the '50s on. Takemitsu, Mayazumi, Ishi are great examples. And then there is Toshio Hosokawa (b. 1955), one of the preeminent living exponents. 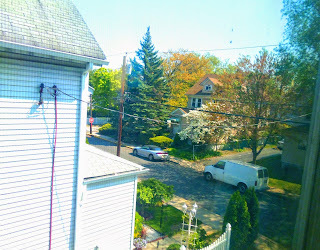 His music has crossed these pages before, notably Landscapes (see posting from November 3, 2011). He returns today with Orchestral Works 2 (Naxos 8.573276), covering three recent works performed by the Royal National Orchestra or the Orchestre National de Lyon under Jun Markl. They are quite attractive pieces. "Woven Dreams" (2009) has a Zen mysteriousness about it, as does "Blossoming II" (2011). Both are more soundscaped unfoldings than linear events, they evolve and transform more than they are sectioned. There is an acute sensitivity to sound color in a modern context and Hosokawa is especially effective in creating his own wordless narrative of soundings. "Blossoming II" has a more dynamic outlook, but both ebb and flow in original ways. "Circulating Ocean" (2005) divides into 11 movements, played continuously. The composer conceived here of "sound as water", as he explains in the liners. It too begins mysteriously, quietly, almost impressionistically, with waves of sound gently breaking at first. The music gathers density, clouds form, breakers grow in sonic strength, the music's agitation increases, then there is a suspended feeling as the clouds amass. There is then a tremulous agitation as a storm breaks out. The waves again gather momentum, then recede into relative quiet once more. The work ends with mystery, as it began. It is a wonderful work in its otomatopoetic reading, its analog of natural forces at work. In a way it is akin to Honegger's "Pacific 231" and that work's musical embodiment of a train gathering steam and heading with increasing speed to its destination, only Hosokawa gives us the ocean in all its Japanese Zen mysteriousness. It seems fitting and fills one with a kind of wonder. Both "Dreams" and "Ocean" are world premiere recordings. 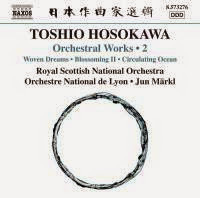 All three works give us a vivid picture of Hosokawa's modern orchestral poetry. They are extraordinarily interesting, the performances are convincing. All is worthwhile. Highly recommended, especially for those seeking to grow with Japanese modernist music from our current millennium. Tchaikovsky! Not Pyotr Ilyich, but rather Boris (1925-1996). He too was Russian, one of the principal composers after Shostakovich. Why we in the West don't know much of him I am sure is complicated, but his music has begun to be heard here, especially on the Naxos label. A new CD of his chamber music is now out, well played by the Vanbrugh Quartet and guests. Two works are represented, the Piano Quartet and The War Suite (Naxos 8.573207). This is music of great gravitas, and in that way his affinity with Shostakovich is clear. Yet the music speaks eloquently for itself, as a bellwether of Boris Tchaikovsky's inventive originality. The liners to the CD tell us that the "Piano Quintet" (1962) is considered by many to be his finest chamber work. Listening one can hear why. It is filled with dramatic impact, modernist stridency and Russian brio. On this basis alone I find myself wanting to hear more of him. 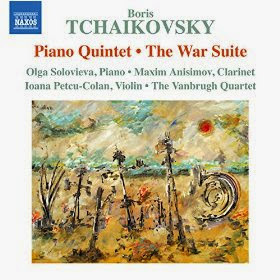 And more we do hear, namely "The War Suite" (1963/2011) for string quartet and clarinet (the later played well by Maxim Anisimov). It is based on Tchaikovsky's film score for While the Front is in Defence, about the WWII battleground southeast of Leningrad during the winter of 1942. In the suite form this is the world premier recording. The material from the score was also worked out as Tchaikovsky's "String Quartet No. 3". As a suite we hear music depicting war and its terrors but also friendship, heroism and tragic love. It is a varied work, both tender, brutal and brusquely lyrical. The clarinet rings out in nicely staged contrast to, and in sonorous blend with the quartet. It is a work that seconds the Quintet as a good companion, with an enlarged pallet of moods, albeit with less of the structural rigor and perhaps a bit less of the brilliance of the former. The two works most certainly give you a good idea of Boris Tchaikovsky in the chamber setting. Like the 20th century Russian masters before him he shows an innate sense of what roles each instrument will play and proceeds to make very idiomatic use of them for an irresistibly dramatic result. All modern Russophiles will no doubt find this disk rather essential. It is music that holds its own for originality yet partakes of the Russian modernist ethos, both of which situate the works nicely as part of a continuum. The Vanbrugh Quartet, pianist Olga Solovieva, and clarinetist Maxim Anisimov give us impassioned performances filled with brio and lyrical clarity. Very impressive music, very well played. This is a good one! Who would have predicted at the turn of the 19th century what was to come in the 20th? Looking back now, we see an incredibly varied 100 years, with innovations piled one upon the other. Yet it is no longer shocking as it once was found, the newness now mostly familiar, the music appreciated more and more for the brilliance encountered. 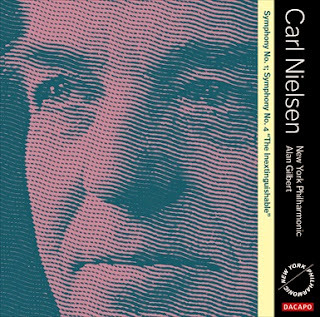 Danish composer Carl Nielsen came along in the beginning of the period and was a force for the new, one of the brooms that swept out the excesses of romanticism, yet did something with that legacy in the process that was totally unprecedented. He refashioned it in his own image, made it a force for modernism that had neither precursors or followers in the direct sense. Nielsen was a school of one. His symphonies, all six, take their place in the pantheon of remarkable cycles. Happily, the New York Philharmonic under Alan Gilbert have embarked on the journey to realize the cycle today in new recordings. The second volume, with the Symphony No. 4 "The Inextinguishable" and the Symphony No. 1 (DaCapo 6.220624) has just come out. It is seminal, I would say. The New York Philharmonic had a great Nielsen interpreter in Leonard Bernstein last century. Now it has Alan Gilbert. The first symphony is up there as one of the boldest first symphonies around. Comparisons with Brahms' and Mahler's firsts come to mind. All three entered the fray with a remarkably mature first, having all the seeds in place for their fully blown later works, yet retaining a self-contained completeness that sets them apart as marvels in their own right. Nielsen's first is the most romantic, perhaps, of all the Danish master wrote. Yet thematically there is something very originally Nielsenian about it. It sings in the hands of Gilbert and the New Yorkers. The flow and differentiation of voices puts this one on a par with the very best on disk. You forget that the first is necessarily a prelude of even more "characteristic" Nielsen symphonies. And with a work of this dynamic beauty one should hear it on its own terms. On the other hand the 4th, the "Inextinguishable", gives us the fully realized Nielsen, which you could say also of his 3rd, 5th and 6th. It is a late romanticism so totally original that it does not synch with the others, partially because it is drenched with Nielsen's very own modernism. It is all quite involved on a tonal-harmonic level. It creates lush carpets of mystery and a sometimes semaphoric, signalling melodic structure that comes out of the orchestra like an impassioned, urgent communication, yet relates to the overall arc of the symphonic game plan in the most organic sense. Like Nielsen's use of the snare drum in the 5th, the 4th has some passages for timpani that function melodically and dramatically. And of course that is only a part of the lucidly urgent singing quality of Nielsen's later symphonies. There is a Northern feel in Nielsen's best music that has no real counterparts. Sibelius may come the closest, but he had a lyric quality that Nielsen has in a different but parallel way, but of course Nielsen pushed his music much farther away from a derivative romanticism into modern territory. Sibelius had his own romanticism, and it pretty much stayed put inside that in its own original way. Nielsen takes more risks in his later symphonies and they pay off every time, virtually speaking. Alan Gilbert's Fourth is a triumph. There is strongly defined part writing that Gilbert realizes vividly, and a dramatic push on the edge of the ecstatic that this version captures beautifully. It is a one-four coupling of great strength and ruggedly craggy beauty. There is no better Fourth out there to my mind, though many good ones. Gilbert and the New York Philharmonic give us Nielsen in all his glory. The First is given all its due; the Fourth shines like a beacon. Today's new music classical scene most certainly has a fair amount of activity in the minimalist, post-modern, radical tonality or plain-old elemental tonality zone. Of course as we have seen on these pages there is a good deal else. Nevertheless there are composers working in the former territories that we have not as yet covered. One is up for review today. His name is Jacob TV (or Jacob Ter Veldhuis, to use his full given name) (b. 1951). He purveys what he calls "avant pop", which sounds catchy enough, but doesn't always quite fit what he does. Hey, it's new music! It isn't pop. Ah, but he no doubt jests with us? No matter. At any rate a significant two-volume CD is out, Complete Solo Piano Music (Brilliant 94873) which features pianist Jeroen van Veen, joined by Sandra van Veen for the two-piano "Views from a Dutch Trame", and replaced by Ronald Brautigam for the "Piano Concerto No. 2 'Sky Falling'", which also brings in the Netherlands Radio Chamber Philharmonic under Thierry Fischer. Otherwise, Jeroen Van Veen prevails, and that suits the music well because he seems to understand the composer quite intimately. We get a sort of post-Satie repose contrasted by busy agitation on the two-installment "Pianobook 1 & 2", then there are more directly minimal works, including some "Boom Box" pieces, so-called, like "The Body of Your Dreams", which samples an over-the-top enthused exercise device ad while creating piano melodies that echo the pitch implications of the speech-sounds, something in the manner of the Reich of "Different Trains" and other works from that period. It may be popular out there to do this and Jacob TV puts the mix together in a clever manner, but frankly I can get tired quickly of this sort of thing. Mercifully there aren't that many here and they take up little space. So I suppose it is good to include them to be sure and give us a representative sample ("complete" at any rate) of what Jacob TV is about. The "Piano Concerto No. 2 'Sky Falling'" has a very diatonic radical tonality bent. It is even just plain "tuneful" and treats us to a refreshing piece of music whose sometimes cheerfulness belies its inspiration--the 2008 recession and a reporter's comment on it, that the sky was "not falling". There are moments where the cheerfulness drops off for a moment or two, fittingly. It captivates. 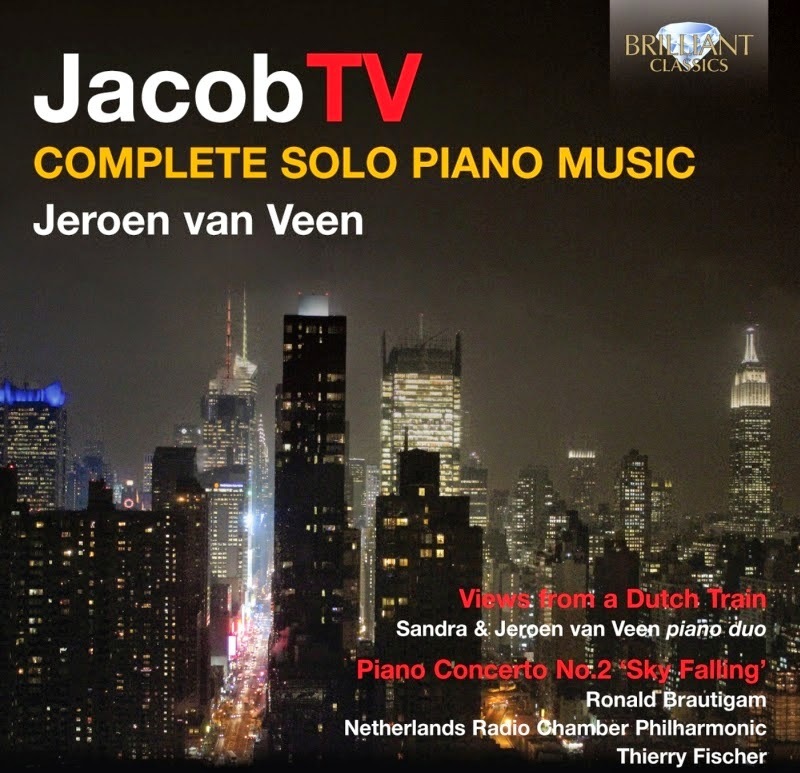 Jacob Ter Veldhuis channeled through Jeroen van Vleet embodies pianistic sensitivity in a set that has many quite lovely moments. Pianist van Vleet seems exceptionally sympathetic to this music, giving us straightforward yet evocative performances throughout. It is very accessible fare, something even a stubborn anti-modernist may find enchanting. Yet there is nothing vapid or new age about the music. It is filled with twists and turns that show a very musical mind at work. Time flies when you listen. Yet there is a contemplative side to it all as well. There is music that speaks with beauty and flow, sometimes more so than with structure. The structure is there, but like a building where the support beams are hidden it is less something experienced than felt. 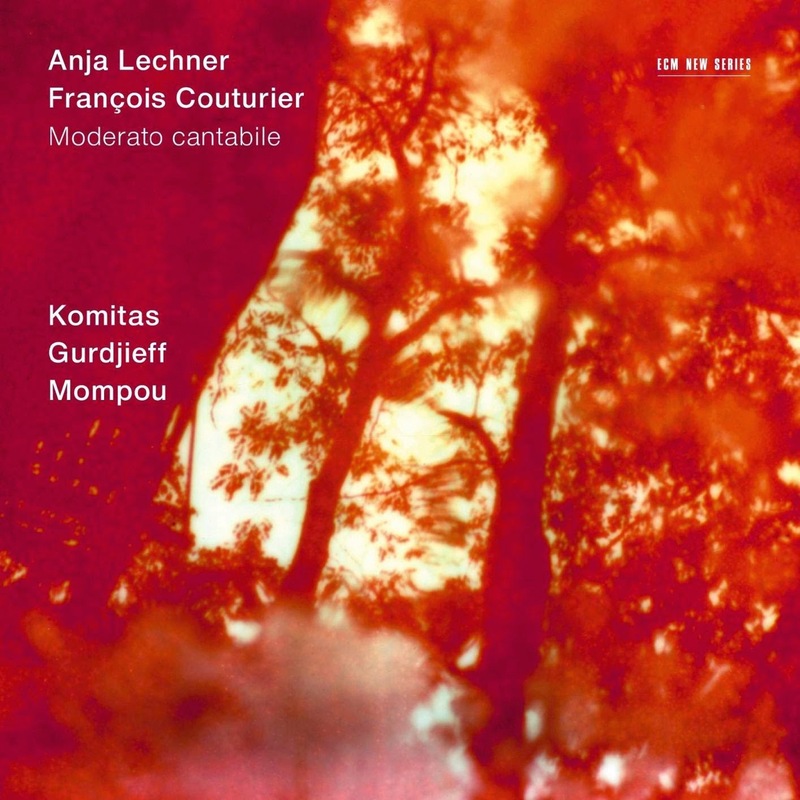 That would characterize the new album by cellist Anja Lechner and pianist Francois Couturier, Moderato cantabile (ECM New Series B0021592-02). The two were a part of the rather striking album Il Pergolese (see January 16, 2014 posting) and here launch their duo. Lechner comes out of the classical world but has a big interest in improvisation; Couturier comes from the jazz end of the spectrum, but through his arrangements and compositions leans here and elsewhere increasingly toward the classical realms. This album freely rearranges and improvises around music by Gurdjieff (Transcaucasian), Komitas Vardapet (Armenian) and Federico Mompou (Catalanian). The re-arrangements of the music give us an open quality, beautifully cantabile throughout, yet also somewhat Eastern in its sound, tonality and concern with space, partly because of the original music itself, part given the duo's creative interpretive spin. The playing is exquisite, so evocative of a beautiful repose that it is easy to find yourself drifting with the music, letting it wash over you. The result for me was that it took me a number of listens before I started experiencing the what of the melodic specifics and their lavishly soaring accompaniment. The meditative transparency of the duo sound strikes you right away, the specific language of the works reinterpreted comes a little later. At any rate it is music that puts you in a very nice zone. The fluidity of the duo is pretty exceptional, but like the extraordinary beauty of a beautiful landscape it first ravishes; only later do you spot out the musical landmarks and guideposts to help you in your journey forward. Sometimes there are historical reasons behind the obscure posterity of a composer. Certainly that was true in the case of Hanns Eisler (1898-1962), a substantially prolific, extraordinarily gifted Austrian composer, a Jew who throughout his life maintained an unswerving allegiance to left-wing politics. He studied with Schoenberg and was a most promising force in the contemporary new music scene in the Middle Europe of the pre-Nazi era. He began his career in Vienna, moved to Berlin in 1925, and like Kurt Weill, incorporated cabaret and pop elements into his music. Like Weill also he collaborated with poet-lyricist-playwright Bertolt Brecht, in Eisler's case primarily via songs and incidental music to Brechtian theater works. With the rise of the Nazis Eisler's music was banned along with many others and he left Germany abruptly, then made various stops in Europe before coming to the US to teach at the New School in 1938. He made the treck to Hollywood in 1942, wrote scores for movies which brought him some acclaim and several Academy Award nominations. His left-wing affiliations got him in trouble in 1947, when Nixon and the HUA put him before their tribunal. He was deported and eventually spent his last years in East Berlin, where he was accepted but even then subjected to the strictures of Social Realism which prevailed during the Stalin era. So there are reasons why Eisler's music is not well known today. Indeed some of his music has strong agit-prop qualities not likely to endear him to mainstream concert goers. Yet we manage to celebrate Weill's early theatre music nonetheless, which has strong political content inherent in Brecht's librettos. 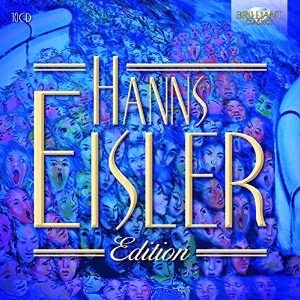 Recordings of his music have been available here and there in the post-modern era, but nothing of the scope and breadth of the newly released Hanns Eisler Edition (Brilliant Classics 9430) a comprehensive ten-CD retrospective covering the full breath of his output. The lyrics to the vocal music are not included, but you can download them from the Brilliant site. What we have in this set is an impressive set of recordings, many made in East Germany, nearly all very good performances. It is not the complete Eisler but it covers a great deal of his music: symphonic, chamber, songs, piano music, symphonic vocal and choral. Here and there the music is strictly agit-prop, especially some of the choral works, but never so much as to dominate. As for the rest, it shows us a composer of exceptional talent. There are wide-eyed modernist works from his early years and even later, cabaret music that will remind pleasantly of Weill yet not reproduce him, some beautiful chamber works....There is no way to give detailed descriptions with a set of this magnitude. I came away from listening to this all with a revelation that Eisler was a major composer whose politics kept him out of the Western rediscoveries and revivals that the music of many other Euro-exiles eventually enjoyed in later years. Perhaps his time has come. Certainly the Brilliant set makes a case for his talent and abilities, and that at a very reasonable price. Not everything is brilliant, not surprisingly, yet there is genuine facility to be heard and appreciated throughout. Anyone who values the historical modernists will find a good deal in this set to like. He may have been forgotten, but we can now easily get exposure to the music here and make up our minds. Recommended. Over the centuries there have been many composers who spent a good deal of time conducting others' works and learning a great deal thereby on the specifics of orchestration and musical conception of the greats first-hand. Julian Wachner is a contemporary who has done that. He has especially done so in the context of sacred music, holding down a number of musical directorships/conducting positions at such institutions as the famous Trinity Church on Wall Street. He comes to us today in the guise of a composer, and an excellent one he is. Specifically we have a three-CD set of his music, performed under his conductorship, in the Symphony No. 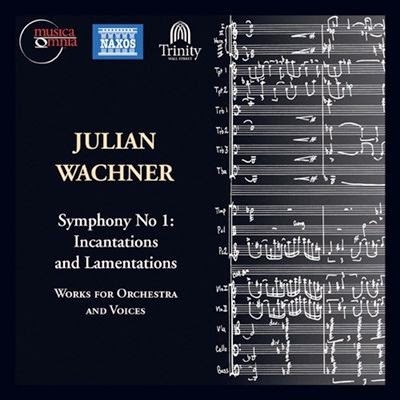 1: Incantations and Lamentations, Works for Orchestra and Voices (Musica Omnia 0604 3-CDs). The set contains so much that is worthwhile that trying to discuss each work might get a bit tedious. Suffice to say that the 13 works proffered in the set cover a good deal of time, from the 1989 "Psalm Cycle I" to the 2014 "Blue, Red and Green". 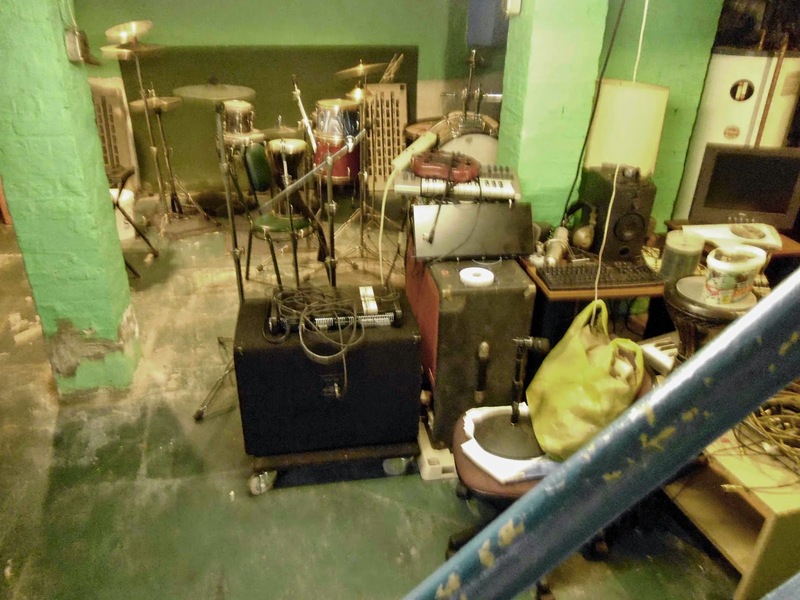 In the process the set covers a developmental traversal of musical space as well. A good bit of it is sacred music, most is very contemporary in tone, though a few channel early church music styles to their own end. 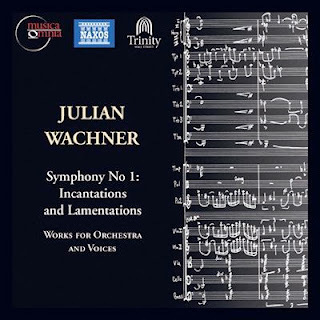 Wachner has an excellent knack of getting stirring sounds from voices, both soloists and choirs. He also has mastered orchestration so that the instrumental parts work together for a lucid transparency or a rousing mass of varied voices. Wachner has a pronounced rhythmic sensibility and puts it to good use in movements that have shifting meters and a dynamic thrust to them. At some point you occasionally detect a Bernstein influence (the Mass sometimes comes to mind as a precursor), other times some of the voicings and counterpoints of later Reich also seem to be launching points, still other moments there is a jazziness to it all. But then there are the tender and mysterium aspects, too. None of it sounds derivative. It does seem an integral part of a developed grand tradition of sacred music, with Wachner taking his place in a potential pantheon. But time will be the judge of that. In the meantime we have this set to appreciate. The works are substantial, the performances lucid and bold in outline (listen for example to the Trinity Choirs) and the sound well-staged, spectacular. Anyone who wants to know what's good out there in American modern sacred music must hear this. If that is not your specialization you will still be well-served by this set. The music comes from a composer who needs to be attended to, for music that holds its own in a modern contemporary tonal mode. If you are well familiar with composer Moritz Moszkowski (1854-1925), German-Jewish composer of Polish descent, you have a leg up on things. I believe I have a piano concerto of his somewhere in my stacks of vinyl, otherwise he was an unknown quantity when I opted to review his Complete Music for Four Hands (Brilliant Classics 94835, 3-CDs). He was admired by Paderewski, more well known in his day perhaps than ours, but that latter of course says nothing against his music. The box set of three CDs gives you everything he composed for piano four hands, and that's a good deal of music. Domenico Monaco and Michele Solimando render the music with great charm and spirit, which is exactly what the music needs. We have to remember back to a time when of course there were no radios, televisions, music audio players of whatever stripe. Most people had the parlor piano installed in their residences, certainly those musically inclined. Piano music that was simple enough to be played by the amateur could sell as sheet music to the profit of composer and publishing house, especially if the music caught on with the public. If your house had more than one accomplished pianist, music for piano four hands could give the family some fine entertainment. These Moszkowski works seem designed and well-suited for such musical evenings. The parts are not too difficult for the amateur, yet they yield some very full pianistic music with a large sound and some very memorable themes. Some of the waltzes and mazurkas are regularly ordered so that dancing no doubt was also possible. Before you say to yourself, "sounds like a banal sort of waste of time" consider that these pieces are very well-constructed, have some excellent thematic memorability, and have in addition some of Polish and even (latent?) Jewish folk qualities--and other attractions that make them hard not to appreciate. 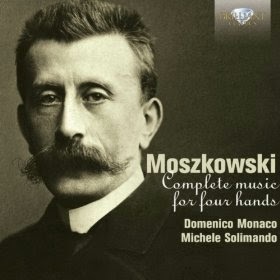 Moszkowski was no hack, nor did he engage in the sentimentality that makes some parlor piano music from the era unbearable. Not everything is simplissimo, either. There are at times extension of Chopinesque poeticism, regularized without much rubato to make a four-handed presentation fairly straightforward. I found the music delightful, more than I had expected in fact. They transcend time and place and speak to us. The romanticism is contained in classical structure and folk effusion, so the music does not sound dated. Plus this box set is at a very decent price. An evergreen forgotten is still an evergreen. This music remains fresh and lively after all the years, and the performances are all what one would hope for. Grego Applegate Edwards Talks About the First Album, "Travels in Tyme"
SELF: So what, do you think you are special or something, coming out with an album of your own at this point? What are you doing? GREGO: Special? Anybody who is honest thinks they are special, because like it or not they must live a lifetime inside themselves, and to do so you must take a certain amount of care in order to keep surviving. So the first thing I do when I wake up every morning is take a little care that both feet are placed squarely on the floor before I stand. Everybody does that sort of thing. It is the special quality of existing that makes them do it. But otherwise? I have been given the opportunity in my life to express myself and I have taken some care there, too, that it be somehow worth doing. The hearing of the music I have made is up to others. That either follows or does not by subsequent events. So, really no, not special so much. Just here and creating out of my life whatever may come. SELF: OK, so you care. Tell us why we should care about this album? GREGO: You shouldn't. Not automatically. There is so much music out there, who can afford to care about it all without somehow losing it? There's no good reason on the surface of things why you should care. It isn't going to matter at this very moment, to you at least, whether you hear this album through or not, of course. SELF: Well that's all well and good. We should not care, you tell us. So why are you here? Come on, you know you want people to listen and if possible to get something from your music, don't you? GREGO: Alright, yes. But not in some "put on the CD and life will be groovy" sort of way. It's not going to make your life groovy. I can't see how any one album will do that right now. Though when I was younger some albums really DID change my life. But with my album that would be asking too much. The first time you hear it you may hate it, not understand it, or maybe you will find it interesting. That's in part a matter of who YOU are as much as what the music does. But sure I want people to like it. SELF: So then what sort of person do you think will respond to the music? GREGO: There's no one answer. I can only say that the music reflects at least in part three musics that have most influenced me in my years of listening, thinking, playing and writing. One part is the electricity of rock as explored in the golden years of early Hendrix and beyond. There is some of that juice to be heard in these pieces. Another is the intensity of so-called free or avant jazz. Coltrane, Cecil Taylor, Ornette, Ayler, Elvin Jones, all have had a big effect on music as I hear it. But then the entire jazz tradition is something inside me and it fills me with great respect, though this music doesn't channel the tradition really. Others do that, better than I could. Still, I hope there's some of the elation and power of that music, though this music is not about long solos, chops, or much in the way of the individuality of any one instrument. It's more an ensemble music. The third area involves modern new music, from the sound advances made in the last century by composers such as Cage, Varese, Ives, Stockhausen and the kind of trance elements the best minimalists have brought to us--I mean Reich, Riley and such. Well now as I think of it, there is a fourth element--that of world music that has influenced me too, especially the music of Africa and South Asia, though this isn't a direct thing. Just part of my musical being when sounds go through my head. I sometimes get that, a hint of it, in the music and my whole idea of rhythm has been shot through and through with those traditions, which you could probably say of any serious drummers out there. It's a common heritage and so it's in the back of anybody's head that came up learning to drum. SELF: OK so some four different stylistic areas have gone into the music. But what about where we started, that a certain kind of person, or kinds, would most likely respond to the music? GREGO: I guess anybody who has cast a wide ear-net of listening over the years, who has delved in one or more of these areas in some depth might be likely to respond to the music. Not to sound pretentious, to claim I am this or I am that. Just that my music partakes of some of those essences. 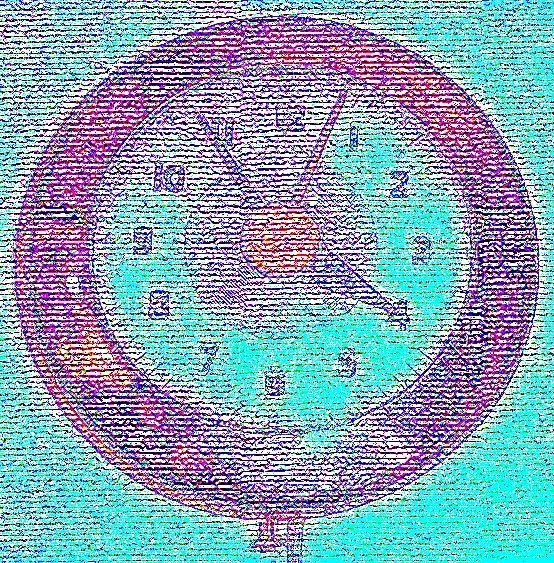 But all more or less directed in a particular way of looking at "time" in music. SELF: What do you mean, like different meters, Brubeck and Time Out or something like that? GREGO: Well I heard Brubeck's time albums growing up. "Take Five" was an AM radio hit, which is hard to imagine today. Many of my generation got exposed to odd meters through some of that. But really Brubeck only did that for a while; he had other things that made him interesting, too. The classic Coltrane Quartet did things with polyrhythms and polymeters that took it further. And really that influenced me more. And so also in my musical training and practice meters have been important and in part I address that in my music. But there is something else as well. Rhythm with a big "R". What is it really? It is a series of occurrences within linear time, of sounds and silences. Africa and South Asia developed the most sophisticated rhythmic senses in their musical cultures, and that's one thing. John Cage made us very aware of all sound existing inside and outside us as potentially significant. And the fact is the sounds of humanity, nature, the universe in motion can go pretty far along in terms of the ratios of the sounds and their coincidence. So if you listen to a bunch of crickets in a natural setting, for example, you'd be hard pressed to express the whole of it in simple musical notation. And yet theoretically there is a ratio-specific complex, a rhythmic whole to be grasped. Imagine that the entire universe could be conceived of as built on one tempo, with everything branching out as differential ratios against that? Not that there is one tempo, that we know of, but suppose there was. Absolutely every sound occurring in the universe could be related to all the others in terms of ratios--and those ratios would soon become too complex to hear perhaps, it might turn to a kind of aural mud, yet there would be always a connection you could put together in your mind's ear so to speak, a connection of relations of one pulse with another. And those ratios would soon get far more complex than is typical of music as we hear it. SELF: So what are you driving at, then? GREGO: Hold on and I will try and bring this back to where we are here. Before I was aware of Cage or had any sophisticated understanding of music, as a kid, I nevertheless was a keen listener to the sounds in my world as I grew up. I believe this is natural, especially for anyone with a musical proclivity, which I definitely had early-on. Anyway crickets, katydids, clocks, raindrop patterns as they fell against a window or onto the roof, multiple bells ringing at different velocities, I heard those things growing up and it fascinated me. At some point by the time I was around ten I guess I had two old farmer's wind-up alarm clocks I found that I used to keep going. They would tick at different tempos so that sometimes they locked together but other times they became farther and farther apart until they began to converge again. I thought that was cool. A couple of decades ago I was jamming with some friends and one of them brought a cheap Casio keyboard that could sample. Once you sampled something you could press different notes on the keyboard and each would play back the sample at a different velocity and pitch--the high notes giving you faster velocities than the low, in a gradated way. If you pressed a number of keys down it would give you that same convergence and divergence that the two alarm clocks did, only there were more velocities involved so there were different stages of convergence. SELF: So what does that have to do with the music on Travels in Tyme? Anything? 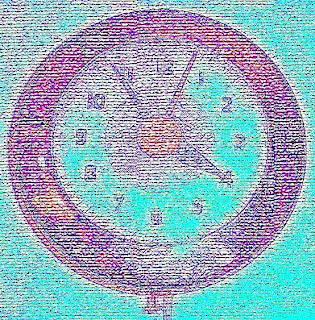 GREGO: In some cases I grouped a bunch of instruments at a common tempo and came up with some through composed melodic phrases that would contrast with the open time zones, to make it a little more varied and I hope interesting, so it's not all bleeps and bloops coming together and scattering. 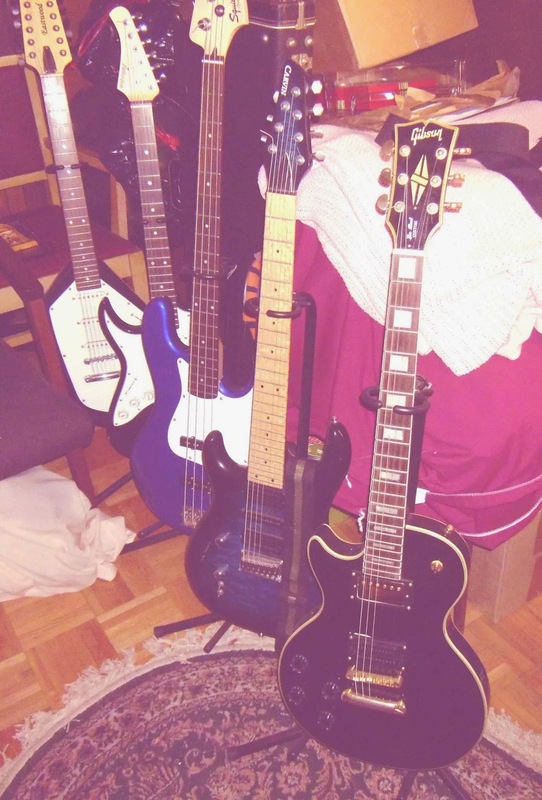 SELF: OK. Why do you play all the instruments yourself? GREGO: I did that so I could fool around with the attacks and sounds in a kind of experimental way and not waste people's time if I tried things that didn't work. Plus I had no resources to pay anybody to play the music then (or now, for that matter). It was a shot in the dark, really, too. I wanted to be able to play with the structures and see what worked. SELF: And so you ended up with an album of music that sometimes sounds free, sometimes has a rock edge, and sometimes has a new music feel to it. Was that on purpose? GREGO: Not expressly. I just let myself flow and see what came up. As it happens the various influences came though in ways that I could predict, and sometimes in ways that surprised me. SELF: And so that's what we end up with here? GREGO: Yes. I hope those who listen to the album will experience it as a whole, because each section follows out of the others. In the future I hope to do something further in real time, with a live orchestra or big band. It's not a "pick the hit" sort of thing, as an MP3 for your i-pod. It may take a little patience to get with the music, but I hope some people will give it a chance. I thank folks in advance for listening. By the way, to my creditors, if you are reading this it is not about making money. I doubt that this first album will net me more than a pittance. It is being released for the sake of the sounds, not to gain an income from it. So don't be expecting this to amount to more than a piece of change, and that in a long while. This is not music for money. It's music for the music. SELF: Well thanks for the interview. GREGO: No problem. It's the least I can do for my SELF. The European Jews who managed to survive the horrors of WWII and the Holocaust must have felt an extraordinary ambivalence. One does not simply return to normalcy, to everyday life in the wake of such momentous tragedy, such evil. This ambivalence was what composer Moses Pergament, of Finnish-Swedish Jewish heritage, must have felt. He had shown a remarkable aptitude for music in youth, studied it in St. Petersburg for four years beginning in 1908, and settled in Stockholm in 1916, taking up as a music critic and composer and more-or-less settling permanently there, though he spent some time in Berlin and Paris studying conducting in the 1920s. He composed The Jewish Song (Den Judiska Sang) (Caprice 21834) in the closing period of the war, 1944, based on the poetic texts of Ragnar Josephson. It is a choral symphony of imposing stature. Incredibly this recorded performance is the first and only one extant. The work has been neglected, forgotten in modern times until now, when we can hear it complete, in a major 1974 recording by the Royal Stockholm Orchestra, the Stockholm Philharmonic Choir and soloists under conductor James DePreist. It is a sprawling work of great power, anguish, a lament for the six million Jews who perished under the reign of terror spread by the Third Reich during their existence. It is alternately hopeful, despairing, militant in its resistance, sure in its faith and yet struggling against the bleak, incredibly harrowing reality that had enveloped the world. In the end, resolution and determination, thanks that the nightmare had come to an end. It is serious music in tone, expectedly. Somber. Impassioned. Musically there is a slightly discernible influence of later Mahler, especially of "Song of the Earth" (as the liners note) but this conjoined with Pergament's expressive individuality, which introduces something of his Jewish-Yiddish Euro-heritage with something of his Nordic locality, all transformed to his own dramatic sense. There is much in the way of vivid turbulence to be heard in the 70-odd minutes of the performance, contrasting with passages of sad tenderness for the innocent. A sarcastic reference to "Deutschland Uber Alles" forms one of the very memorable moments of this monumental work, but there is much else to appreciate, to be moved by. The performance has an authentic power to it. Everyone rises to the occasion, from soloists to choir to orchestra. It leaves us somewhat stunned. Or that's what it did to me. The rest may be silence, more than a moment's worth. DePriest and company have done us an enormous service by making the work available to us, and doing it so well. German composer Karin Haussmann (b. 1962) has as her starting point the creation of sound in its new music essence. Works for Ensemble (Coviello Contemporary Deutschlandfunk COV 91410) gives us a nicely varied assortment of five of her recent works as played with detailed attention by the E-MEX Ensemble under Christoph Maria Wagner. These new works have flow, much attention to timbres and spatial unfolding within a realm of high-modernist abstraction, but without especially showing a standard pointillistic influence via Darmstadt and the serialists. The compositions generally unfold theatrically and evocatively without having detailed literary analogs. Haussmann creates abstractions that convey meaning without relying heavily on extra-musical thematics, though often based on one or more coloristic, gestural or conditional principles as starting points. But make no mistake, there is nothing cold or clinical about them. The opening work on the CD, "Two Movements for Piano and Ensemble" (2008) makes use of jagged figures in the piano while the ensemble has moments where it "breathes", sounds continuous figures in a kind of breath-like flow. In the second movement the ensemble moves away from responding to the piano and more to articulating varied forms of periodicity while the piano widens its role to a mysterious series of clusters and utterances, all metaphoric of how a balance wheel functions in a mechanical clock. The music has a magical quality. "a fuoco lento" (2009) premiered at a culinary event, hence the literal meaning of the work's title, "at a low flame". Haussmann conceived of the work as initially limited like a kind of entree made of a few key elements, ingredients as it were. The note b-flat, the bowed and striking of metallic objects by the percussionist, both are are key elements that the composition works around. The solo organ work "con flessibilita" concerns itself with the various sound resources, the various manuals and the two Venetian swells available to the organist. Haussmann successfully gives the organ a flexible tone-color quality which makes of the organ a more permeable, plastic color-wheel of sorts. "Four Movements for Cello, Accordion and Ensemble" (2010-2011) works further with the ideas developed in "Two Movements". The sound capabilities of the cello and accordion were chosen to create contrasts that the ensemble reacts against. The soloists take on the role of "recoloring" the music through exerting influences, as the composer says, which brings the ensemble into a kind of timbre-oriented dialog. So we have clusters in the accordion, for example, versus sustained multiphonic tones in the cello, and so forth. "Quartet" (2000) finishes off the program with trumpet, flute. cello and piano sounding, in the composers words, as a single instrument. 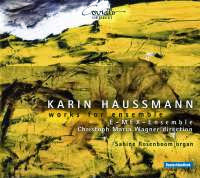 Haussmann experimented with trumpeter Marco Blaauw in creating "disaltered chords", richly harmonic, rough multiphonics that tend to beat with variable periodicity. The quartet gives a four-instrument analog of the disaltered chordal sound. All these various concepts put into play by the composer results in some striking music, high-modernist yet freshly concocted into striking sound color worlds that make the music particularly contemporary, of our time. It is music that will be appreciated by the adventurous modernist. Time spent acclimating oneself to the new worlds of sound pay off with a very rewarding experience. The centennial of Andrzej Panufnik's birthday (1914-1991) has brought us a spate of rather remarkable recordings, many covered here (type his name in the search box above for those). Today, another. This one is Volume 8 in the Deutschlandradio Kultur series of "Orchestral Works", namely a compendium of three Concertos (CPO 777 687-2). All three are from his fully mature, later period, a Violin Concerto from 1971, Cello Concerto from 1991, and Piano Concerto from 1961/1972/1983. The Konzerthausorchester Berlin under Lukasz Borowicz sound fine indeed and give the music a characteristic flourish that seems right. The soloists rise to the occasion. The Violin Concert was written originally for Yehudi Menuhin. Panufnik tried to emphasize spiritual and poetic possibilities rather than pyrotechnics, building long melody lines for the violin using simple intervallic relationships--basically the major and minor third of a triad in well-conceived permutations. The violin soars above the string orchestra throughout. The work has a somewhat moody character but brings to us a singularly singing quality well realized by soloist Alexander Sitkovetsky and the orchestra. 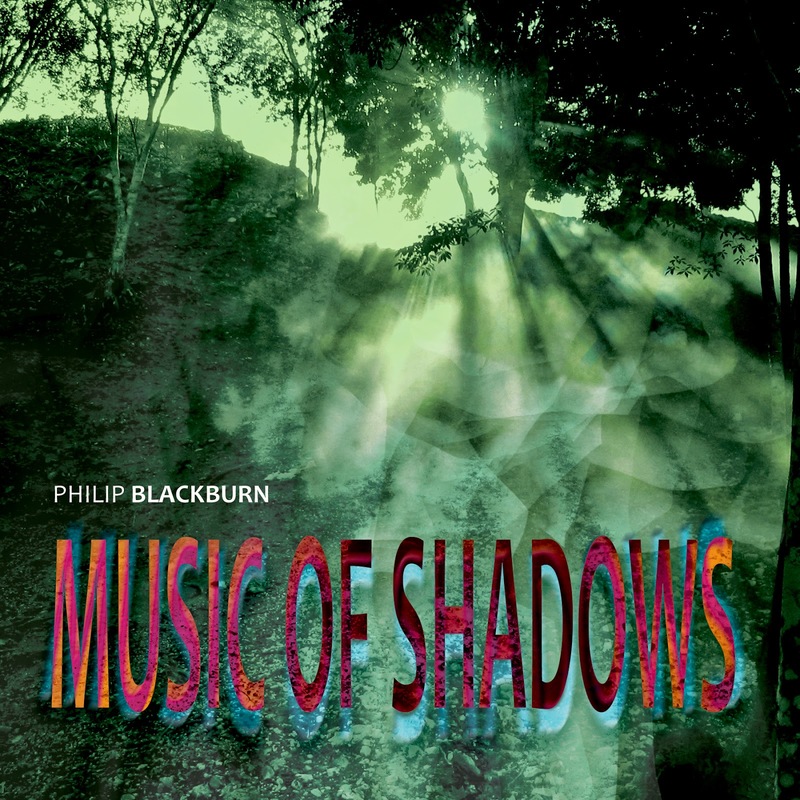 It is in its own way a masterpiece, once of Panufnik's most appealing. The Piano Concerto is more virtuoso-oriented, with poetic qualities, bravura and at times an almost jazzy immediacy, especially in the rousing, restlessly modulating perpetual motion of the final movement. Ewa Kuplec excels in the piano role, with great energy and poise. The first movement was newly composed in 1983, the rest thoroughly revised in 1972. The Cello Concerto is the latest of the three works, written in 1991 with Rostropovich in mind, who gave the premier. The music is conceived as a sort of structural palindrome, though to the naked ear it all sounds through-composed. Raphael Wallfisch renders the solo cello part with grace and intensity. So we have another volume in the series, one of the very best. The three works do much to convince us how Panufnik never flagged, went his own way, and lit up the musical world with his own brand of brilliance when all was right. These concertos are sterling examples of that and the performances leave nothing to be desired. Very recommended. Vespri solenni per la festa di San Marco (Naive) reconstructs and celebrates a Vespers service in the Basilica of Mantova, San Marco, such as it would have been performed during Monteverdi's lifetime. This in honor of the 30th anniversary of Concerto Italiano, conducted by Rinaldo Alessandrini, one of the principal Monteverdi exponents of our era. Alessandrini knew what such a liturgical service contained, so it was a matter of making choices from the Selva morale e spirituale collection. The recording at hand contains a complete Vespers; there are other selections that would have been possible; this choice seemed to Alessandrini a good one. Apparently he plans to record the complete "Selva" in the coming years, and this is a first step toward that. 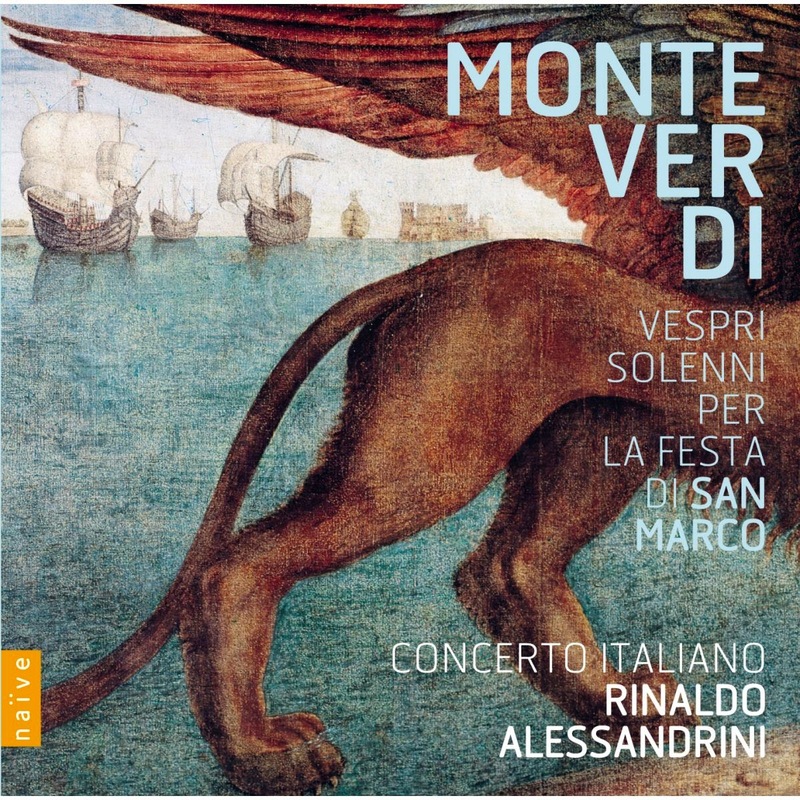 The set comes with a bonus DVD documentary by Claudio Rufa on Alessandrini conducting Monteverdi. Musically we have some very beautifully stirring Monteverdi done in the authentic manner. I would heartily recommend this one for any early music enthusiast--or those wishing to explore the genre with something exemplary. It is primo Monteverdi. I've gotten a nice boost upwards into the compositional world of Carter Pann (b. 1972) with his latest CD The Piano's 12 Sides (Naxos 8.559751). Joel Hastings gives us very enveloping, vibrant renditions of the 2011/12 title opus plus a number of shorter works, all but one enjoying their world premiere recording here. Pann has an ultra-musical pianistic outlook and the works, especially the hour-long title suite, have a kind of plain air post-impressionism about them, modern yet with a lyrical eloquence that suggests Debussy and Ravel but in extension, as Carter Pann music, with some excitingly contemporary elements, all sounding especially well as piano music. "The Piano's 12 Sides" gives us a series of 12 vignettes, each filled with light and color. "Soiree Macabre" gives us an old-time, jazz-stride-related refrain surrounded by ruminations and eruptions. "An Irish Tune", the final number in the suite, is in fact Carter's lovely take on "Danny Boy". All of it gives your ears and your musical psyche a lift with beautifully modern harmonies, cascades and adventures into imaginative piano realms. 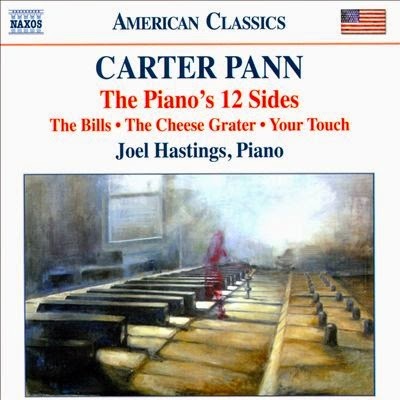 "The Bills" (1997) and "The Cheese Grater" (1996) have modern ragtime-early jazz feels influenced by his studies with WIlliam Albright but given a Carter Pann spin. They are very fetching and filled with elan. The final "Your Touch" (1997) is in fact the cadenza from his "Piano Concerto No. 1" and leaves us in a thoughtful mood. Maestro Pann has a wonderfully lyrical and sometimes almost puckish outlook that bears our attention very well and strikes one as thoroughly contemporary, even though he has one eye on the past and what he sees he transforms and reshapes to his own vision. Joel Hastings plays these works as if he were born to them. He has just the right combination of touch and cool, yet impassioned power to make the performances truly characteristic. I must say I find this one much to my liking. Any lover of the thoughtfully poetic qualities of the pianoforte as developed by the more dazzled and dappled composers and performers over the last century will find this something familiar yet fresh, a delight. 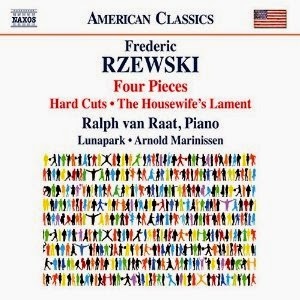 American-born Frederic Rzewski (b. 1938) has roots in improvised as well as composed music. He was a pioneering founder member of Musica Elettronica Viva (MEV) along with Richard Teitelbaum and Alvin Curran in the '60s, a cooperative ensemble that created exploratory improvisational music which spanned the gap between free jazz and new music; it also notably featured live electronics along with conventional instrumentation. They were one of the first who covered this territory and helped spawn an avant garde hybrid that continues to be important today, especially in Europe but in the USA as well. He is a virtuoso pianist and of course a composer, initially studying with Sessions, Piston and Babbitt among others, then making his way primarily in Europe. His piano solo compositions are especially well-known. "The People United Will Never Be Defeated" is one of the more popular, having enjoyed a fair number of recordings over the years, including one by pianist Ralph van Raat, who also is the pianist on the new release discussed here. Four Pieces, etc. (Naxos 8.559759) features three compositions/suites covering a wide span of Rzewski's output from 1977 to 2011. "Four Pieces" (1977) finds the composer in an expressive, tumultuous mode typical of his music of that period. "Hard Cuts" (2011) is in three movements and joins pianist van Raat with the chamber ensemble Lunapark for a fascinating quasi-concerted work that has expressive chromatics joined with well-configured, continually forward moving modern harmonic transformations-modulations in an edgy mode. In the final movement "Like Bees" it turns to a bee's nest buzz of drones that builds outward to a high modernist return to open tonality. "The Housewife's Lament" (1980) takes an anonymous, Beethovenesque tune from the mid-19th century and constructs a set of very exploratory variations around it. 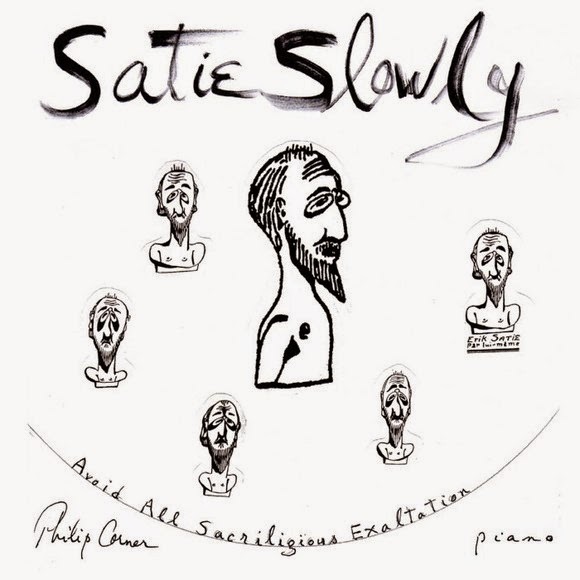 It is all exemplary Rzewski, a composer never comfortable to remain in formalist high-modern expression, but ever searching for stylistic linkages with the past, the world and the future. Ralph van Raat has the technique and a temperamental affinity with Rzewski that makes each of the three works sing with energy and panache. The volume serves as a good introduction to the composer for those who do not know him well. Rzewski afficionados will welcome the volume, too. Anyone living life around New York especially will no doubt recall exactly what they were doing and their experiences on the morning of 9-11. Those outside the immediate area will do the same, but perhaps with less of the kinetic shock those nearby felt. It was a horribly defining moment for many of us, a moment that changed everything one way or another, for some a loss of personal innocence, a rite de passage into an afterward at least initially of twilight and loss. Composer Kenneth Fuchs has come to terms with this via Don DeLillo's novel centering around the tragedy and its aftermath, Falling Man. 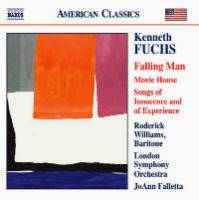 Fuchs has composed a number of works based on the theme, but now we get to experience the principal one, aptly titled simply Falling Man (2009-10) (Naxos 8.559753), for baritone (Roderick Williams) and orchestra (JoAnn Falletta conducting the London Symphony Orchestra). It is a moving work that sets to music the opening passages of DeLillo's novel dealing directly with one man's experience on the streets during ground zero. The baritone describes the horror of the scenes the character witnesses while the orchestra comments mournfully but even somewhat mysteriously, as in a dream, the unfolding of those moments. It is a masterful work, in its own way a kind of analog to the Hindemith-Whitman work "When Lilacs Last in the Dooryard Bloom'd", on the horrors of the Civil War and the death of Lincoln. Both are requiems in their own way. Both filter the immediacy of the horrors through a mediation and meditation of poetics, music and memory. Roderick Williams gives us a definitive performance that is seconded by the greatly poetic reading of the score by Falletta and the London Symphony. Companion works on the disk contrast well. Both are also for baritone--and a pared-down chamber ensemble. The first, "Movie House" (2007), gives us a number of poems by John Updike that evoke vividly the optimism of the '50s. Concluding the disk is "Songs of Innocence and Experience" (1977), an earlier work based on the William Blake poems, including of course "The Tyger". Both remove us from 9-11 by moving back in time, two other eras with their different moods, and in a way to Blake summing up the process of knowing what one knows (or intuits) after the loss of innocence. Would I personally have set "The Tyger" in the way Fuchs does? No, but it works anyway. Fuchs was just setting out and the mood he sets for the poem is perhaps a bit more innocent than it would have been had he done it right after 9-11. This a mere parenthetical comment. The three pieces work exceptionally well together regardless. Fuchs is in every way a fully developed composer-personality of today. These three works in the masterful hands of Falletta and Williams, in the carefully dream-like performances of the London Symphony Orchestra, come through as works we can ill afford to ignore. Kenneth Fuchs sums up something about being alive right now in the three works taken together. He speaks to our age as a direct contemporary, neither overstating nor understating, bringing us a very musical-poetical portrayal of where we have been and where we are. On that basis I would say that this disk is pretty near indispensible for those wanting the new music as it lives for us right now. Kenneth Fuchs captures that, and thanks to the beautiful performances we can live inside of it here, as we live the aftermath of what came before. Organ music of high caliber occupies a special place in the classical repertoire. The people who know it well and listen intently to it are a group somewhat set apart from the regular stock of folks, in that they aren't as typically mainstream as the average classical aficionado. But the great organ music deserves as much attention as any of the other genres, so there is no musical reason why that is the case. Take the music of Naji Hakim (b. 1955), for example. He studied with Jean Langlais, which puts him firmly in pedigree with the French Organ School, that begins with Franck, through to Vierne and all the way up to Messiaen. Hakim's music does indeed have a great symphonic wholeness to it that typifies the school. 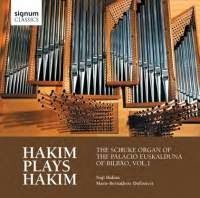 But judging from his first volume of his music as played on The Schuke Organ of the Palacio Euskalduna of Bilbao in the Hakim Plays Hakim series (Signum Classics 389), he also excels in scherzo-like levity at times. But at any rate it is music that needs to be heard. The current volume contains seven compositions, several in multiple movements, the 13-part "Die Apostel" (2011) being the most unusual in that it is written for organ duet, and accordingly his partner Marie-Bernadette Dufourcet joins in with him on the recording. All of it maintains interest via Hakim's excellent command of the forces of the modern cathedral organ, its power and its color contrasts, and his inventive writing. His short but very virtuoso-istic "Ave Maria" based on Schubert's well-known melody has definite clout. But there are other, beautifully contrasting moods represented here, from the varied "Esquisses Gregoriennes" (2006) to the majestically swirling vortex of his "Toccata" (2011). The organ sound is spectacular, as well recorded as it is powerful, and Hakim's music sets it through its paces. The music has at times some pretty modern sounding harmonies, which puts Hakim in our time. But he also has a nice sense of the French tradition that comes out along with a certain playfulness now and again and just a touch of his Beirut heritage. This is a volume organ enthusiasts will value. It is not avant high modernism, as you may have gleaned from my description, but it is a collection of well-constructed music from an original organ voice of importance today.